Overview: Mar-Vell! An alien warrior of the ancient Kree race, linked by destiny for some strange, inexplicable reason with Rick Jones, a youth in whose mined rests the power to save the universe… or destroy it. This is Essential Captain Marvel Vol. 2. Following the events of the Kree-Skrull War (see Essential Avengers Vol. 4), the Captain Marvel title returns to the newsstands after a two-year hiatus. Captain Marvel now has a sidekick of sorts, with pal to the heroes Rick Jones. Now wearing the Nega Bands, Mar-Vell and Rick exchange places with each other between Earth and the Negative Zone. The length of time that one can spend in the Negative Zone tends to vary from issue to issue. Regardless, spending time away from Earth is really putting a crimp in Rick Jones’ dating life (sorry Lou-Ann!) and his budding music career. After a couple of issues, Jim Starlin takes over the book and the book just explodes in greatness. Captain Marvel (and Rick) head off to space, where they are fighting to stop Thanos from capturing the Cosmic Cube. But before they can get to Thanos, they must face off against the likes of the Blood Brothers, the Super Skrull, and the Controller. And let’s not forget that the Supreme Intelligence still takes great pleasure in trying to make things difficult for the Kree’s wayward son. Eventually, Captain Marvel and Rick find a way to extract themselves from the constraints of the Nega Bands. As much as they are tired of being linked to each other, they find that they still need each other and choose to remain as travel companions across the galaxy. What makes this Essential? : This collection is way more interesting than the first volume. Captain Mar-Vell really comes alive when Jim Starlin comes on board as the writer and penciller. Transforming the character from a stranger on a strange world into a cosmic entity that can hold his own with the most powerful beings in the universe makes him much more interesting. And giving him a main enemy to be fighting against rounds out the character and provides an even better reason to keep reading. 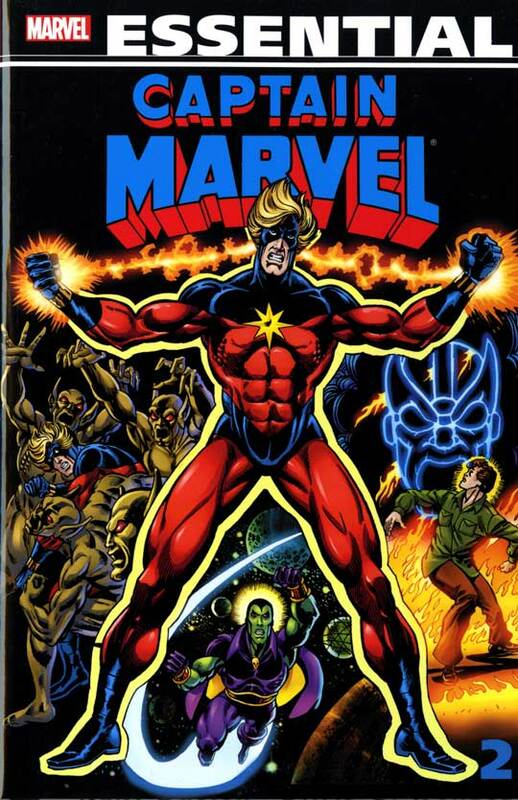 Footnotes: Captain Marvel #36 is a reprint of Marvel Super-Heroes #12, the first appearance of Captain Mar-Vell. That issue can be found in Essential Captain Marvel Vol. 1. The new cover and three new framing pages are included in this Essential. Iron Man #55 is also reprinted in Essential Iron Man Vol. 4. Marvel Feature #12 is also reprinted in Essential Marvel Two-in-One Vol. 1. Captain Marvel #33 is also reprinted in Essential Avengers Vol. 6. If you like this volume, try: The Thanos Quest mini-series from Jim Starlin and Ron Lim from 1990. Given the incredible success of Avengers: Infinity War, everyone is trying to get the back-story on Thanos. Once we get past the Captain Marvel run, Thanos is barely used in the 1980s, usually only in flashback. It’s not until the early 1990s, when Starlin returns to Marvel, that Thanos’ story resumes. In an effort to win the love of Death, Thanos seeks out the Elders of the Universe, who each happens to possess one of the Infinity Gems. If Thanos can acquire all six gems, he can wield the gauntlet and destroy half of the universe. This is an intriguing look into the character, and at times makes him more human. The original issues are quite pricey in the back issue market, so you may want to opt for a trade collection or as a digital read to find these two issues. Overview: Coming in on a 12:30 flight, we are taking a journey to the land of Wakanda on the African continent. A country built on Vibranium, a rare and powerful element that makes this small country one of the most important ones in all of the world, which in turn brings a lot of threats and dangers to the land. This is Essential Black Panther! For years, we’ve known of the Black Panther as a supporting character. First introduced in the pages of Fantastic Four, he was a member of the Avengers for many years. Now, we see Black Panther return home, to handle the responsibilities of leading his country. This collection is broken up nicely into two distinct runs. In the first run, writer Don McGregor, with art from the likes of Rich Buckler and Billy Graham, gives us two great storylines that show the range of the Black Panther character. The Panther’s Rage storyline has Black Panther fighting off a challenge to his throne by Erik Killmonger. The story runs across Africa, from deserts to jungles to waterfalls and caves, Black Panther stands up to the challenges of Killmonger and Venomm to protect his land. 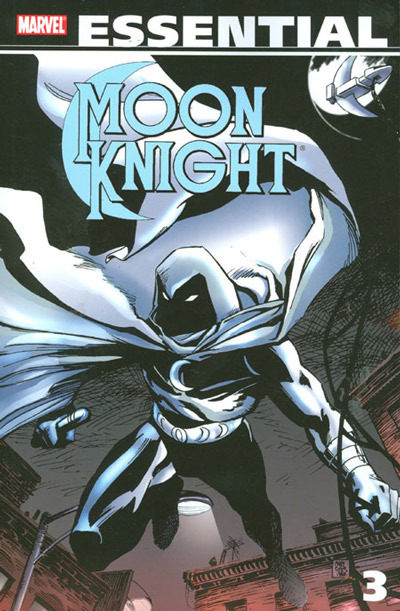 The second storyline from McGregor has T’Challa returning to the United States with his girlfriend Monica Lynne, only to encounter the racist threats of the Ku Klux Klan. This is a powerful story arc on a subject that doesn’t get enough coverage in comics. The second run in this collection comes to us from the mind of Jack Kirby, so sit back and enjoy the run. During his return to Marvel in the mid-1970s, Kirby was given complete control over his projects and went balls-to-the-wall with everything he did, with titles like Captain America, The Eternals, 2001, and Devil Dinosaur. But my favorite run in this period is his work on Black Panther. He takes Black Panther on a wild journey, chasing after King Solomon’s Frog that can travel through time or bringing in his cousins to protect Wakanda from the radioactive Jakarra. These may not be the greatest Black Panther stories, but they have to be the most fun Black Panther stories. What makes this Essential? : These are some must-read stories for the Black Panther character, but I don’t know that this is the best collection to read these stories. 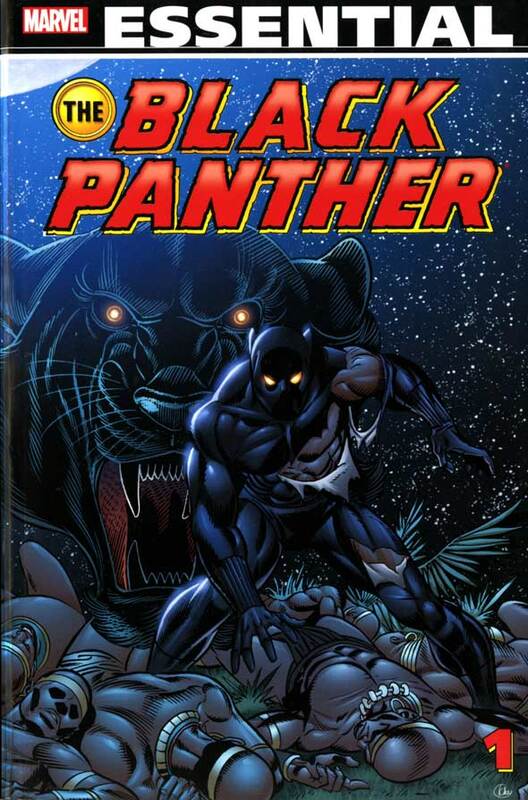 I would have liked to have seen the Black Panther’s first appearance reprinted in this collection, or even his origin story. You can track those down in other Essentials, but it would have been nice to have them in this book, too. The final five issues of the 1977 run (including Jack Kirby’s final three issues!) are not included here. You cannot even find them in an Essential. I truly believe that Black Panther should have been done in two Essential volumes, to include all of these missing issues. My other issue is the printing process for this collection. With a character that where’s a black costume, reprinting the story in black and white makes these stories hard to read at times. This is one of those rare times when I wished I had read all of these stories in a color edition. With all of that said, I do really like these stories. This was the first time that Black Panther got to stand on his own as the lead character in a title or in his own self-titled book. The current success of the character would not be possible without these stories laying the groundwork to establish T’Challa as an A-list hero. Footnotes: Jungle Action started as a reprint comic. Jungle Action #5 starts the Black Panther run in the title, reprinting Avengers #62, which told the Black Panther’s origin (see Essential Avengers Vol. 3). Jungle Action #23 was a reprint of Daredevil #69 (see Essential Daredevil Vol. 3). The covers to issues #5 and #23 are included in this collection. The 1977 Black Panther series ran for 15 issues. Kirby stayed on the book through issue #13. The series was cancelled, but the storyline was finished up in Marvel Premiere #51-#53. Those issues of Black Panther and Marvel Premiere can be found in the Black Panther Marvel Masterworks Vol. 2. If you like this volume, try: any of the following choices. There are so many great options when it comes to tales involving the Black Panther. The first choice has to be the Christopher Priest run of Black Panther from 1998 to 2003. This originally started out as part of the Marvel Knights imprint, but moved over into the main Marvel publishing group with issued #13. You cannot mention Black Panther without mentioning Priest’s name. So much of what we think of with T’Challa, Wakanda and all things Black Panther were introduced in this series. The entire series was recently collected in four Black Panther by Christopher Priest: The Complete Collection trade paperbacks. The Black Panther series that followed the Priest run is great too. There is a period around 2007 when Reginald Hudlin was writing Black Panther and Dwayne McDuffie was writing Fantastic Four. During the Initiative storyline, Black Panther and his then-wife Storm were serving as members of the Fantastic Four, replacing Reed and Sue. There are a lot of fun stories in each title, and the time-traveling Brass Frogs make a re-appearance. Finally, it would be hard to imagine anyone not having viewed it yet, but the 2018 Black Panther movie is a must watch. If you have not seen this movie, stop reading this blog and go watch it. If you have seen the movie, finish reading the blog and then go watch it again. This may be one of the most visually-stunning Marvel movies to date, and it is both a critical and box-office success. Overview: The Defenders are dead! Long live the New Defenders! As we saw at the end of the last collection, With the core line-up (Doctor Strange, Hulk, Namor, & Silver Surfer) no longer able to work together for fear of destroying the Earth, a new team steps from the ashes to become the New Defenders. From the last run, Valkyrie, Gargoyle and Beast stick around, recruiting Angel, Iceman and Moondragon to join them in this journey. With the new team, the dynamics between the various members make for an interesting story, sometimes more interesting than the villain of the month that they would battle each month. Who will lead the team? Is it the Beast, who has trained and studied under both Charles Xavier and Captain America? Is it the Angel, whose bank account is funding most of the team’s activities? Or is it Moondragon, who believes that everyone should bow down to the goddess that she believes herself to be? Regardless who leads the team, we see the story moving forward with hints of things to come. We are introduced to the Dragon of the Moon, who will (SPOILER WARNING SINCE THERE IS NO ESSENTIAL DEFENDERS VOL. 8!) will become a negative influence in Moondragon’s life and lead to the eventual demise of this team (and this title). But before then, we get lots of adventures of the new Defenders. We even get some solo mini-series involving members of the team. First up is an Iceman miniseries, which ran concurrently with Beauty and the Beast, teaming up the Beast with Dazzler (before she joined the X-Men). What makes this Essential? : This is the most transformative era of the title that we have seen. For all of the talk about the Defenders not have a set roster, it was always some combination of the core line-up. Now just Valkyrie remains with half of the original X-Men, plus Moondragon and Gargoyle. So, for a change of pace with the characters, this is an interesting read. But it still doesn’t make this Essential. I personally would have rather seen the two mini-series dropped in favor of finding a way to get all of the remaining issues (it ran until #152) into this collection. I think J.M. DeMatteis and Peter Gillis have fun creating new adventures with these characters, with stellar art from the likes of Don Perlin and Alan Kubberberg, but these are not A-list characters to carry a book. Footnotes: During this run of Defenders issues, the covers reflected the title The New Defenders. 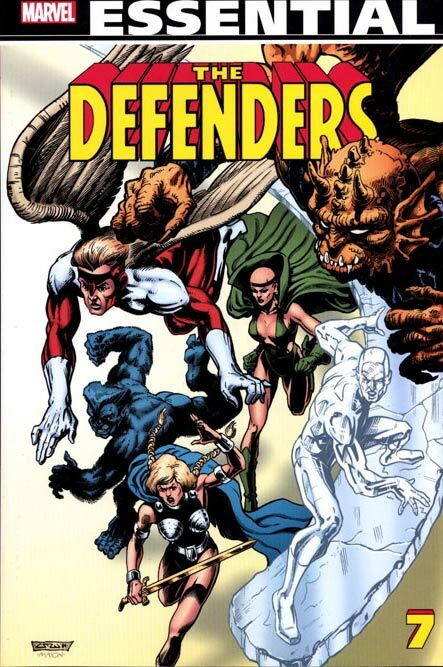 However, the indicia in the original issues indicated that the official title still was The Defenders. It wasn’t until issue #140 that the official name listed in the indicia was The New Defenders. Since this collection ends with issue #139, you could make the argument that Marvel collected all of the original issues in the Defenders series in this line of Essentials. Beauty and the Beast #1 to #4 are also reprinted in Essential Dazzler Vol. 2. If you like this volume, try: hunting down a copy of The Gargoyle mini-series from 1985. 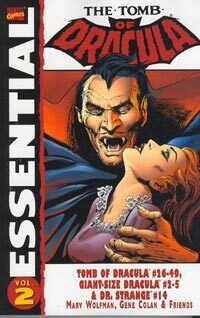 This entire series has never been reprinted, so you will need to hit the back-issue bins to find this. Gargoyle co-creator and writer J.M. DeMatteis, along with artist Mark Badger, finally had the chance to do a solo series featuring Isaac Christians. He returns to his hometown, Christiansboro, Virginia, where Chambers is tricked into returning to his original body. Unfortunately, that allows the one of the demons to return to the Gargoyle shell and begin an attack to destroy the town. With the help of a druid, Christians’ soul is returned to the Gargoyle shell, and the Gargoyle destroys Isaac Chambers’ body so that he can’t be used like that again. This mini-series should have been collected in this volume, perhaps in place of the Beauty and the Beast series since that had been included in the Essential Dazzler Vol. 2 collection four years earlier. Overview: Despite being the best there is at what he does, Wolverine still seems to encounter opponents intent on proving that statement wrong. That works out for us, giving us Essential Wolverine Vol. 6. 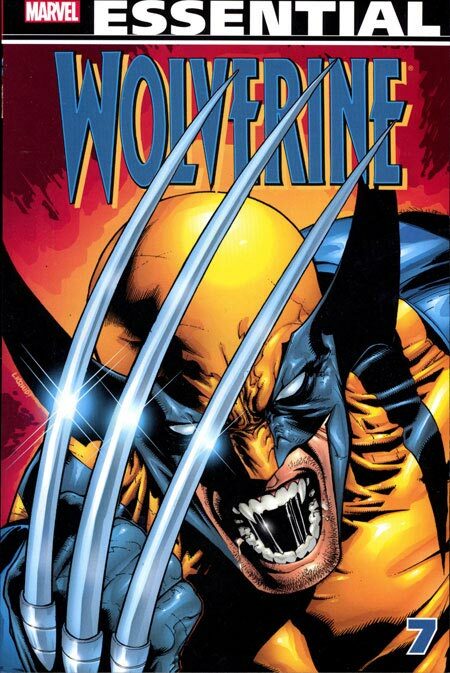 This collection starts out with Wolverine striking out on his own — AGAIN! This time, he goes 35 miles south into the East Village neighborhood of New York City. He finds an apartment, lands a construction job, and lives happily ever after, right? Not so much. Sometimes trouble finds him, sometimes he finds trouble all on his own. In this situation, Logan encounters a killer mime. I can’t make this stuff up, but Larry Hama did! Next Wolverine and the X-Men get caught up in the Operation Zero Tolerance story arc (see below). Following that, Warren Ellis and Leinil Francis Yu step in for a four-issue arc with Wolverine encountering a professional assassin, McLeish, who he thought had been dead for the last ten years. 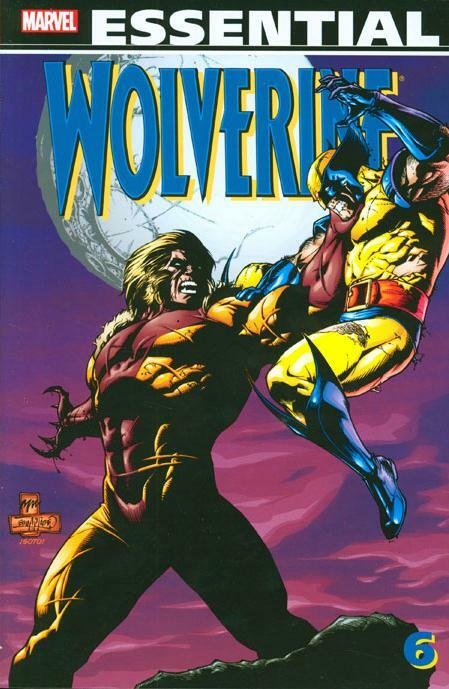 Surviving that, Wolverine encounters two former foes, Roughouse and Bloodscream, who he first met back in Essential Wolverine Vol. 1. This final story in this collection is a fun read as Wolverine finds that he must marry Viper to fulfill a debt of honor. A long the way, most of the other women in Wolverine’s life (Kitty, Jubilee, Black Widow, Jessica Drew, and others) are trying to stop Wolverine from doing so. Of course, any comic book wedding has to be crashed by someone. In this instance, it’s Sabretooth and he wants to kill the groom. What makes this Essential? : OK, I have come around on the Wolverine line of Essentials. With the last two volumes, the printing process did not work well with the new look of the comics. With this volume, the reprinting is nearly perfect. I still had a hard time reading the footnotes, but everything else looked great printed in black and white. The biggest challenge with this line is finding stories that feature Wolverine in a solo adventure. We had multiple crossovers with the X-Men, some more warranted than others. I realize that Marvel sold a lot of comics in the 1990s thanks to Wolverine and the X-Men, but sometimes you want the solo book to be a solo book and not just an extension of the team book. If you like this volume, try: the complete X-Men – Operation Zero Tolerance story. In this volume, we get the Wolverine issues of the story, but it ran across a lot of other mutant books (X-Men, Cable, Generation X, and X-Force). Following the events of Age of Apocalypse, Henry Peter Gyrich and Bastion leverage their positions in the U.S. Government to go after the mutants. Bastion creates a new line of Prime Sentinels which he sends out to capture the mutants. The government takes control of the Xavier School, getting access to files and technology. Iceman steps up and leads a small group to help stop Bastion. Finally, S.H.I.E.L.D. finally intervenes and revokes the Operation Zero Tolerance orders. This has been collected as a hardcover and a trade paperback, so it should be easy to track down.